Dee David & Co. LLC, (VA) - Kitchen Design and Remodeling Planning Guide, Questionnaire, Tips, and Helpful Hints, Fall Church, Virginia. It’s a once in a lifetime investment—creating the kitchen or bath of your dreams. Though you have a solid idea of what you want to get out of the remodeling process, it’s important to understand the process itself. Dee David, CKD, CBD, has over 38+ years experience and it shines through each step, bringing you sensible design at a reasonable price with excellent quality installation. We begin the process the way we end it—with our complete attention focused on you. In operating by appointment only, we’re able to spend quality time exploring your needs, desires and budget. Because your design is entirely unique to you, there is a charge for consultations at an hourly rate. Your design retainer is applied to purchase price of products and/or services. Are you ready to remodel your kitchen, master bath, or home office? Get started on the right foot with our kitchen and bath guides and helpful hints! A guide to prepare you for the home remodeling process and working with our talented team. 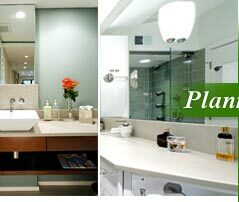 The remodeling experience is one of both excitement and apprehension for the homeowner. A guide to prepare you for the design/build experience. Part of the planning for a kitchen remodeling project should include setting up a temporary kitchen. There are several basic storage principles that will help during planning. The first meeting is with Dee in your home. We call this meeting the Initial Consultation and we do charge for the consultation; $250.00. The fee is applied to your contract should you sign with us. The consultation can last between one and two hours and you can expect to discuss; what your hopes are, what your timing is, your budget, specific materials that you want to use, and even color. Dee can also give you a rough ball park of what your project might cost. After the consultation we then agree on a design retainer. The design retainer is based on what Dee estimates your project to be. This covers drafting, design and specifications. Our minimum Design Retainer fee is $1,000.00. The Retainer is also applied to your contract. Design Only; we furnish you with the design and a “shopping list” of all materials specified in the design, you purchase the specified materials and arrange for the demolition and installation. Design and Deliver; we furnish you with the design and all the specified materials for your project, you arrange for the permits, demolition and installation. This works well for clients who like to do the demolition themselves and or have a contractor that they already work with and are comfortable using them. Please visit Remodeling Magazine's Online Annual report for Cost vs Value for the Southern Atlantic Richmond Area.